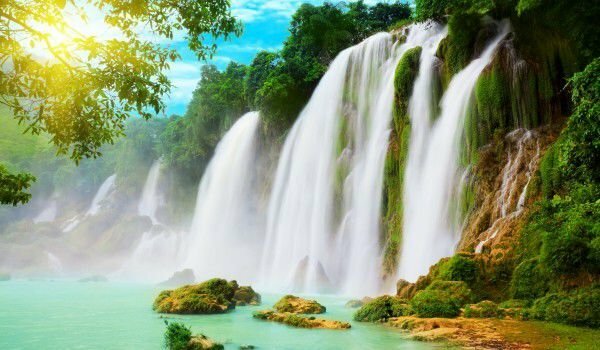 Detian Waterfall is one of the amazing creations of nature. Detian is the widest waterfall in the territory of Asia and second largest transnational waterfall. Detian is located within the republic of China, about 40km from the southern border with Vietnam. It is spread along the Vietnamese border in the Chinese autonomous region of Guangxi Zhuang. Detian are actually two large waterfalls that are formed by karst hills around Daxing, which is part of Guangxi Province of the Chinese side. The thunder of the falling waters of Detian can be heard from afar. It is about 200 m wide and is really impressive. The water falls from a height of about 70 meters and is of three levels which the waters fell from trees and rock formations. The length of Detian only remains behind leaders, Iguazu Falls, Victoria Falls and, of course, the beautiful Niagara Falls. Detian Falls was formed along the Guichun River. During the Sino -Vietnamese War, Detian was one of the main points of the Chinese troops to the Vietnamese territory. Today the area of the Detian Waterfall is one of the landmarks of this international field. Visitors and tourists are able to hire a bamboo raft with which to take along the quiet pool in which flows the water of Detian. In addition, it is an excellent place for swimming. Detian Waterfall is different depending on seasons. During the spring months, a deep atmosphere is present of the prime of life. During the summer it is a place filled with a sense of freedom and natural harmony. In the autumn the surrounding woods are stained in pastel, warm tones that reflect the beautiful waters of Detian. Many believe that the Detian Waterfall looks like a sculpture, sculpted by nature. The full force can be felt in winter when the water flows calmly and slowly, suggesting a sense of natural harmony.